Gallery of facial features and meanings of emotions. Usually visagistes and facial stylists represent open or joyful emotions in female faces, but not always cosmetic make-up of outspoken and glad emotional images is necessary. Quiet eyebrows seem glad as eyes and mouth express joyful emotions. Joyful eyes and mouth seem calm as eyebrows express quiet emotions. The happy smile is appreciable in eyes of the person, and serene ideas seem cheerful. The person sees world events anyhow such wants, and feels oneself in the environment how wants, and consequently personal ideas deny any thoughts which can change own notions. 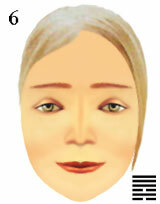 symbol of cosmetic make-up for female faces.